Psychotic State Book Reviews: And the Winners Are . 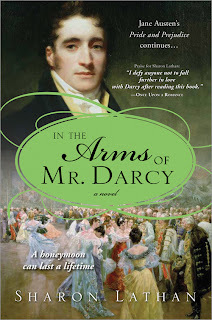 . .
Sarah and Vee are the lucky recipients of a brand new copy of Sharon Lathan's In the Arms of Mr. Darcy, a romantic continuation of Pride and Prejudice's Lizzy and Darcy and their married life at Pemberley. Congratulations, Sarah and Vee! I hope you will enjoy and be as entertained by this inventive book as I was. If you will forward me your mailing address, I will see that your new book gets out to you. Thank you to all who visited my blog and entered this giveaway. I do appreciate each one of you taking the time to visit and post here. I enjoyed reading your thoughts on what makes Lizzy and Darcy the ideal literary couple. I hope you will stick around for future giveaways, reviews and interviews.